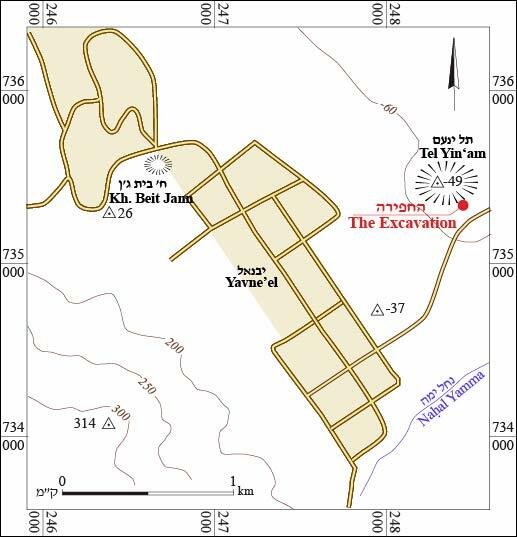 In March 2016, a salvage excavation was conducted in Yavne’el-Bet Gan (Permit No. A-7660; map. ref. 2468310/735420), prior to the construction of a private house. 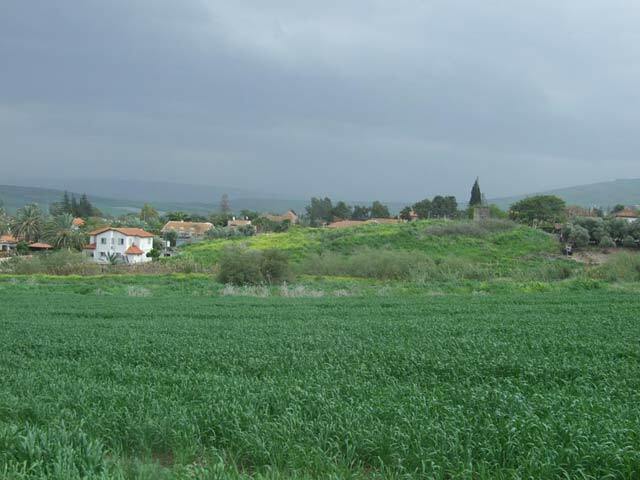 The excavation, on behalf of the Israel Antiquities Authority, was directed by E.C.M. van den Brink (photography), with the assistance of Y. Yaʽaqobi (administration), R. Mishayev and R. Liran (surveying and drafting), N. Zak (plan), Y. Alexandre, K. Cavello-Paran, N. Feig and E. Stern (pottery) and H. Tahan-Rosen (pottery drawing). The excavation was conducted on the edge of the southeastern slope of Tel Yin’am (Figs. 1, 2), in the eastern part of Yavne’el. The excavation yielded potsherds from the Middle Bronze Age IIC/Late Bronze Age I and building remains dating from the end of the Byzantine to the Mamluk periods. At Tel Yin’am, architectural remains from the Late Bronze Age II and the Iron Age were revealed in the past (Liebowitz 1993). Initially, an excavation (7 × 7 m) conducted using mechanical tools exposed a dark brown, colluvial surface layer (thickness 0.7 m). At the base of this layer (L100) were concentrations of small basalt stones that had been noted previously, during the initial test trenching, and soft, loose grayish tell-like soil. The manual excavation was conducted in a smaller area (4 × 4 m; Fig. 3) situated within the original 7 × 7 m probe. 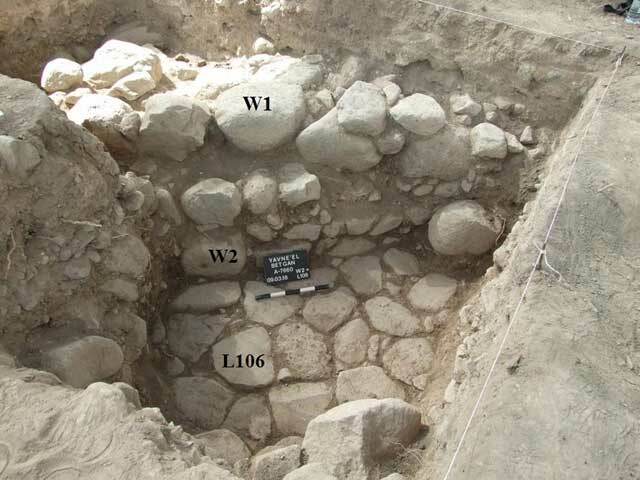 The lowermost layer, exposed in a very limited area (1.0 × 1.5 m), comprised a fill of numerous small basalt stones mixed with potsherds (L108; thickness c. 0.5 m) dating from the Middle Bronze Age IIC/Late Bronze Age I. The virgin soil beneath L108 was not discovered. The top of Fill 108 was sealed by a carefully laid basalt flagstone pavement (L106; Fig. 4) that abutted the northern face of a wall oriented east–west (W2; width 0.7 m). Wall 2 was built of two parallel rows of medium-sized basalt stones, with a fill of smaller basalt stones between them; it was preserved three courses high (0.65 m). The pavement disappears under both the north and east balks of the excavation area, and it may have continued underneath them. A soil fill (L105) covered Pavement 106; based on the pottery found in this fill, the construction apparently dates to the fifth–seventh centuries CE. Directly overlaying the upper course of W2, another, more robust wall segment was exposed (W1; exposed length 4.2 m, width 1 m; Fig. 5), with only a slightly different orientation. Wall 1 was built of large basalt stones and preserved two courses high (0.4 m). Several large basalt stones protruding from both the southwest and southeast balks may be the remains of another wall that was apparently built together with W1, forming a straight corner with it. No floors associated with W1 were found. A sherd-rich soil fill (L103), including a mixture of potsherds from the Late Byzantine and Early Islamic periods (fifth–seventh centuries CE), covered the top of W1. Exposed above Fill 103 was a yellowish lime-like layer (L102; thickness c. 0.15 m; floor?) and above it a thin, brownish-gray loose soil layer (L101). Layer 101 contained numerous Mamluk-period potsherds and was sealed by the surface layer containing several concentrations of small basalt stones at its base level (L100). Although the date of W1 is uncertain, it most likely predates the Mamluk period. Pottery. The earliest ceramic assemblage found in the excavation derives from Fill 108, the lowermost layer. This small ceramic assemblage dates to the Middle Bronze Age IIC/Late Bronze Age I and includes fragments of an open bowl (Fig. 6:1), a thin-walled carinated bowl (Fig. 6:2), a holemouth krater (Fig. 6:3), three jars (Fig. 6:4–6) and two disk bases (Fig. 6:7, 8). The ceramic assemblages deriving from Fills 103 and 105, covering W1, W2 and basalt Pavement 106, date chiefly to the Late Byzantine and Early Islamic periods (fifth–seventh centuries CE). 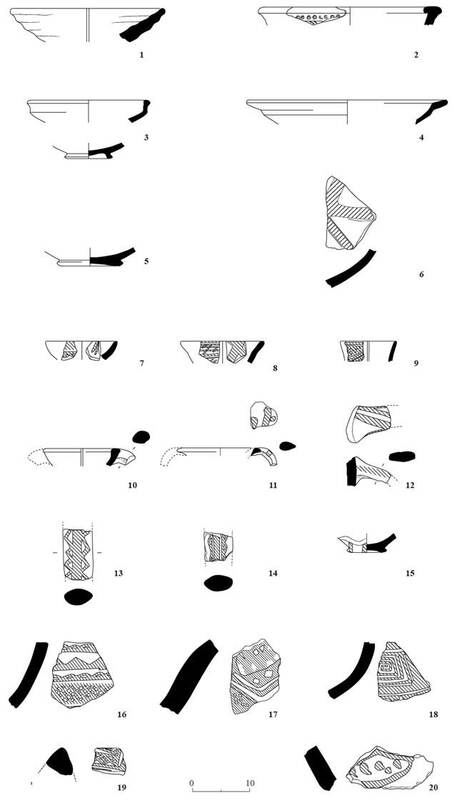 These assemblages include Cypriote Red Slip bowls (Fig. 7:1–8), several bowls of Early Islamic buff ware (Fig. 7:9, 10), Late Byzantine and Early Islamic gray basins (Fig. 7:11, 12), Northern bag-shaped jars (Fig. 7:13, 14), other jar types (Fig. 7:15–19), an Early Islamic Khirbat Mafjar jug (Fig. 7:20) and body fragments with pre-fired combed decorations (Fig. 7:21–23). The latest ceramic assemblages found in the excavation derive from upper Layers 100 and 101, which cover the yellowish lime Layer 102. These assemblages date to the fourteenth–sixteenth centuries CE and comprise mainly Mamluk pottery, including handmade unglazed plain bowls (Fig. 8:1, 2), glazed bowls (Fig. 8:3–6) and painted bowls (Fig. 8:7–20). 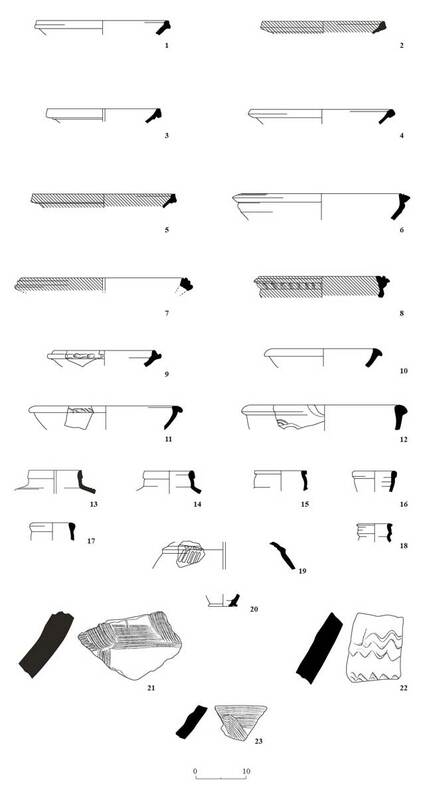 The earliest Middle Bronze Age IIC/Late Bronze Age I ceramic assemblage from lowermost Fill 108 may be related to the Late Bronze Age settlement previously exposed at nearby Tel Yin’am (Liebowitz 1993). Based on the associated pottery, W2 and Floor 106 date to the Late Byzantine and Early Islamic periods whereas W1, which was built above W2, was later than these remains but predates the Mamluk period. 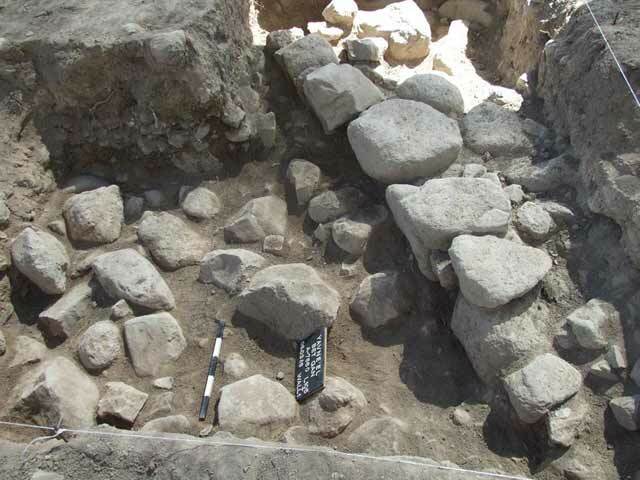 Similar domestic remains—a wall and a floor dating from the Byzantine period—were discovered in the nearby excavation in Yavne’el (Hanna 2009). The pottery found in the upper layers, separated from the lower layers by the superimposed yellowish lime-like layer L102 (floor? ), dates to the Mamluk period. Hanna B. 2009. Yavne’el. HA–ESI 121. Liebowitz H. 1993. Yin’am, Tel. NEAEHL 4. Pp. 1515–1516. 2. Tel Yin‘am, looking southeast. 4. Walls 1 and 2 and basalt flagstone Pavement 106, looking southwest. 5. Wall 1, looking southwest. 6. Middle Bronze Age IIC/Late Bronze Age I pottery. 7. Late Byzantine and Early Islamic pottery.